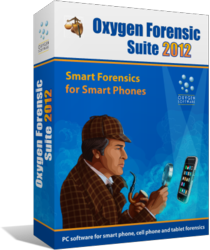 Oxygen Software announces series of upcoming training events on iOS and Android forensics. Advanced iOS Advanced Android Forensic Training and Advanced Android Forensic Training events will be held in October 2012 in London, UK. The training sessions will teach customers extract information from iOS and Android devices, covering popular topics such as platform history, device models, differences in GSM/CDMA/4G devices, forensic differences between the many iOS and Android versions. The sessions will cover information storage principles in mobile devices, data protection implemented in different versions iOS and Android, and provide detailed information about the different acquisition methods available. The training sessions will teach attendees how to discover deleted data, decrypt keychain items, root and jailbreak devices, and cover many other topics and techniques required for successful investigations. Users of free 6-month licenses for Oxygen Forensic Suite 2012 are also encouraged to participate in one of the events in order to keep their free licenses. Advanced iOS Forensic Training and Android Forensic Training programs are designed for experienced investigators, IT security and forensic specialists. Oxygen Software has recently updated its licensing policy, making the Standard edition of Oxygen Forensic Suite 2012 available free of charge for the first 6 month. Under the new terms, the Standard edition of the company’s flagship mobile forensic tool becomes free to eligible customers providing the customers take Oxygen-approved forensic training. Customers passing a certified training may not only keep their free license, but also receive free updates. Under the current terms, certified customers receive the time-unlimited right to use Oxygen Forensic Suite 2012 Standard at no charge. With certified training courses, Oxygen offers forensic specialists an opportunity to obtain the tool and skills necessary to extract evidence out of the many mobile devices available on the market today. Customers passing the training will also receive a status as a Certified Oxygen Forensic Suite User, accompanied by newly issued license keys containing certification information. Certification information will be displayed in the program’s main window, and will be embedded in all reports created by Oxygen Forensic Suite. Advanced iOS Forensic Training and Android Forensic Training programs are designed for experienced investigators, IT security and forensic specialists. The sessions give an overview of state-of-the-art operating systems, hardware and software available for supported platforms, provide detailed information about forensic differences between prior and current generation platforms, and teach attendees the most effective techniques of extracting protected information out of supported devices. Participation costs 999 GBP and includes a 2-day training course on either iOS or Android forensics. Attendees are eligible for a 30% discount towards an Oxygen Forensic Suite 2012 edition of their choice.